Edit 9/20: Added links to Vancouver planner Larry Beasley's comments on tall buildings and DC's Height Act from last year, revealing at the very least an ambivalent attitude toward skyscrapers. 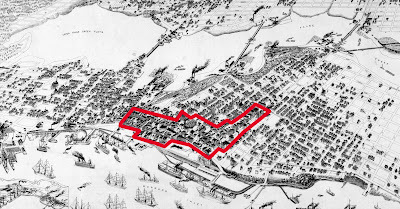 As a follow up to last Monday's post, I'd like to take a bit of a historical excursion to illustrate the effect that zoning has had on Vancouver's downtown commercial district, using that city only as a representative example of many dozens of others throughout North America. The hypothesis that skyscrapers are a necessary adaptation to artificial constraints on commercial space depends upon a showing that space has, in fact, been delineated by legal means, rather than by market forces. The area containing most commercial activity has expanded by about 6.5 times since 1898 as compared to a population growth of 9.5 times (the industrial areas have grown at a far more rapid rate). There are virtually no high-rise buildings at this point, although the technology to build them had been in existence for at least 30 years. That large commercial buildings had replaced many hundreds of earlier freestanding residential homes is evident by comparing the two images. 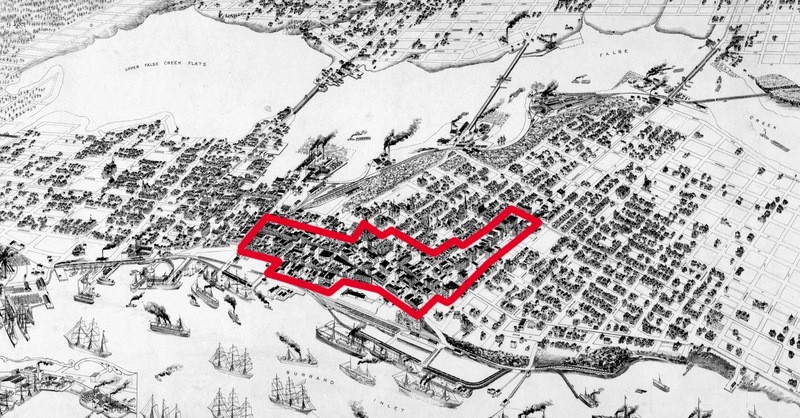 The pattern of growth is that of a horizontal expansion of a mid-rise urban fabric punctuated by the occasional taller building, rather than a vertical concentration of space near the waterfront. If the two maps are compared closely, it is possible to see how, overall, there has been virtually no change in the important boundaries. The combined office/industrial area is nearly identical in both 1930 and in the present map. At most, commercial and residential uses have succeeded small areas of industry in the downtown and parts south (Bartholomew's most obvious miscalulation -- the presence of excessive amounts of waterfront industrial separating homes from the business district -- was actually the plan's greatest asset, as it inadvertently would permit this limited succession of uses). The single-family areas remain well "protected" against the encroachment of higher value uses in line with the intent of the 1920s planners. 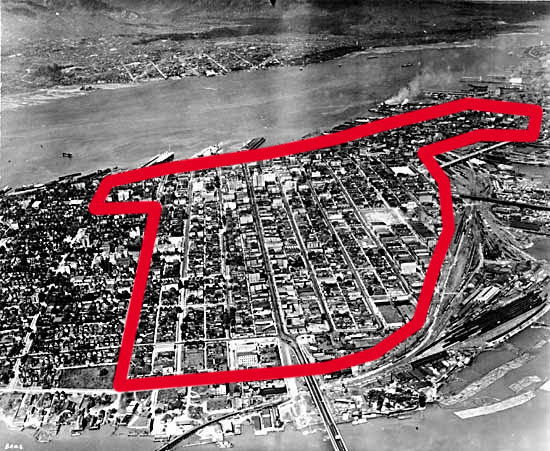 More controversially, the city earlier this year floated plans to relax height limits in the Eastside area, one of the few remaining large-scale area of the 1920s-era downtown that has not been eradicated by high-rises. The proposed change has drawn very reasonable criticism from several quarters (see here and here), yet none that address the fundamental problem: that there is nowhere near enough land available to business uses in Vancouver. Moreover, the zoning-driven shortage of homes has for some time been increasing demand for high-rise residential towers in the downtown, one of the few places such dense "infill" can be built. With much commercial space having taken flight to the edge cities of Burnaby, Richmond and Surrey, it appears the undersupplied residential may even be capable of outbidding undersupplied commercial in Vancouver's downtown. The long term implications of this trend for the city are apparently of concern to Vancouver's city government. Now one can certainly make a case that high rises and edge cities might have multiplied in Vancouver regardless of zoning constraints -- the emergence of a large subsidiary center in Burnaby during an auto era seems predictable given the area's freeway configuration -- but as we see in other cities of the world, where zoning imposes few use-based constraints, mid-rise construction proliferates, with only a handful of scattered towers (Latin American and Japanese cities afford numerous examples). Ed Glaeser has written frequently on the effect of zoning on housing costs while extolling skyscrapers -- perhaps a new study could shed light on the link between all three. 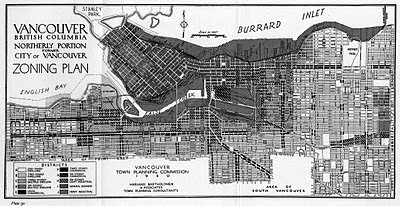 Please note, again, that this post is not intended as a specific critique of Vancouver, as the analysis is probably applicable to dozens or hundreds of other cities in North America which fell into zoning's grasp in the 1920s. The city is arguably one of the best-run of its size, having avoided many of the poor decisions made by American cities. The generally applicable nature of the observations here is the important thing. 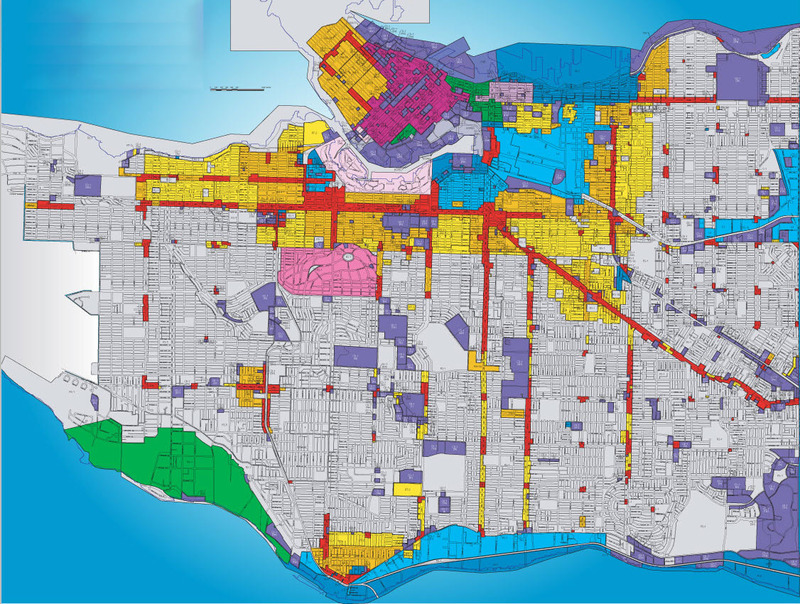 Further reading: Zoning and the single-family landscape: large new houses and neighbourhood change in Vancouver (discussing Vancouver's zoning history generally and the city's extraordinary micromanagement of residential zoning in particular). But, before it gets to late and the opportunity passes, I do want to say "Wow -- what fascinating research and interesting posts!! Thanks for all the thought provoking comments and interesting links, etc. Monday, September 19, 2011, 8:05 p.m.
P.S. -- Apropos your discussion of the Manhattan street grid a while back. I don't believe anyone mentioned it, but the Museum of the City of New York is preparing an exhibition on it -- in December -- curated by Hilary Ballon (the person who curated the Robert Moses exhibits in 2007). Here's a link to a "New York Times" article about the exhibit. If the link doesn't work, the name of the article is "200th Birthday for the Map That Made New York, by Sam Roberts, March 20, 2011. And, although this is rather late in the game, here's a link to the Architectural League's competition for ideas (reworkings?) of the Manhattan street grid. I don't quite follow you. Skyscrapers came about because the geographic footprint for office space was restricted through zoning? Is this the argument? Because I don't see the connection then with Vancouver, whose height restrictions seemingly prevent their construction. If I had to guess I would say that restricting office zoning space in basically all 3 dimensions would cause rents to increase and a large suburban office building boom to capture the excess demand. Still, an interesting post as usual. Benjamin -- thanks for the heads up about the exhibit. I'll definitely be attending. I'd be interested to read any critique you've put together so far, also. These posts are more ruminations than hard and fast conclusions, and I welcome any alternative opinions. Anonymous: my argument is that height limits in Vancouver have been steadily relaxed in reaction to rising demand that has few other outlets. Prior height limits did not prevent skyscrapers, only very tall skyscrapers. 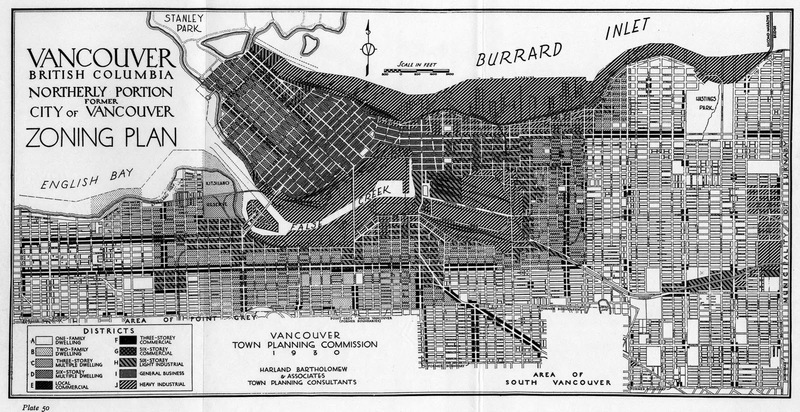 Now, an infusion of new residents is crowding out even commercial uses, which flee to suburban office zones, not because commercial doesn't value the location, but because in Vancouver proper downtown is the only place with zoning permissive enough to accommodate large numbers of new arrivals (and thus we see that Vancouver's downtown, a fraction of the city area-wise, has accommodated 40 percent of the city's population growth from 1996-2006). Interesting theory and very nice historical work. You won't catch me defending low-intensity, single-use zoning. And it's certainly plausible that zoning constraints limiting the amount of usable commercial land induce taller buildings. Zoning constraints should function roughly the same as geographical constraints such as mountains and rivers, although they're ultimately easier to work around. I doubt Manhattan would be as tall if it weren't an island. 1. 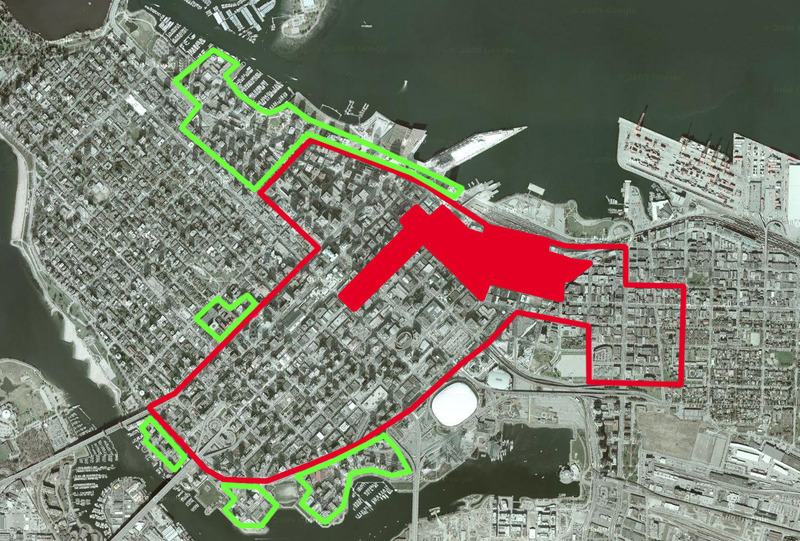 While low-density residential zoning necessarily limits the amount of land available for a commercial district, it also reduces the district's employment catchment. That is, given two cities with equivalent transportation networks, the denser city's downtown has a larger catchment and thus greater potential demand for central commercial space. This is a long-winded way of saying that Vancouver's single-family zoning might have reduced the demand for centrally-located office space even as it served as a straight-jacket. Low-density zoning cuts in both directions. 2. You don't make this claim, but Houston is a counterexample to any claim that tall buildings are entirely a product of either zoning constraints or geographical limitations. Houston does have some development regulations, but one can put low-rise, mid-rise or high-rise commercial virtually anywhere restrictive covenants don't forbid it. Houston's commercial centers have nevertheless developed as clusters of tall buildings. There are three major clusters (downtown, the Med Center, the Galleria) and a handful of minor clusters. There is a massive amount of office space downtown; nothing prevented it from spreading out into surrounding neighborhoods over the years. On the contrary, the downtown has seen waves of redevelopment as smaller buildings were torn down for taller buildings. Ditto with the Galleria and Med Center. Why not spread out horizontally, which is cheap, rather than tearing down and building up? Certain kinds of businesses are willing to pay a hefty premium for being near one another. 3. Why Europe and Latin America have few tall buildings while the United States does is an interesting question. But note that because tall commercial buildings are so expensive, they will be built only when there are high returns to the agglomeration of "knowledge" workers. The marginal product of the average downtown worker must cover the extra construction cost. Worker productivity might be too low in some places to justify the expense. 4. Your theory presupposes that taller buildings allow greater density, at least for commercial uses. I agree. Thanks, Chris. Specifically addressing the point about Houston, I'm not sure I would agree that Houston's center has nothing preventing it from spreading horizontally. The loop formed by I-45 and Highway 59, drawn very tightly around the downtown, creates a substantial barrier to an unbroken expansion of the downtown fabric, and essentially redistributes land values from the fringe of the business district to the existing core. Even so, the concentration of high rises in a very small area within even that small core zone does suggest a proximity premium. Whether the result of that growth pattern is desirable for the city, for property values, for economic growth, for livability, etc., are separate questions. Points 1 and 3 are very intriguing -- although as to 1, the downtown's "catchment" still has increased in excess of the rate of the horizontal expansion of the downtown, just not to the same extent as when using the figures for the metro area as a whole. This is consistent, I think, with the simultaneous emergence of edge cities (serving the fringe single family areas now distant from the initial CBD) and the vertical growth of the downtown. When shopping for commercial constructing yourself it is necessary to pick an experienced and professional company when having a building erected. Companies or vendors offering commercial construction services need to sign the commercial construction agreement or contract in which a party agrees to provide all labor materials, equipments, supplies and do all things necessary for the construction and achievement of a commercial building. Owners, contractors, retailers, architects, etc can all very much profit from hiring an experienced to help out with this type of construction. Developing these types of buildings is a very mixed up process, and having qualified help will make all the difference.